This is an exciting year for Hair Fair, having spanned 10 whole years in Second Life. It is one of the longest running Charity Events to have ever been on the grid, and is always highly anticipated. Hair Fair has always been connected to a Charity, and this year is no different. 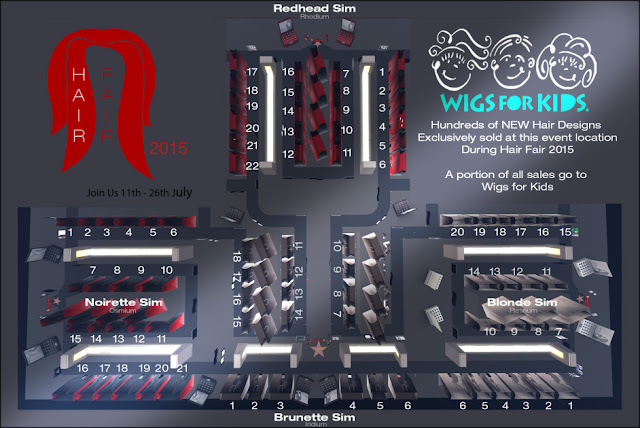 Proceeds from every sale made at Hair Fair go to Wig For Kids. Various Designers contribute various amounts, so please look for signs in each booth. There are also Bandanas at each sim, costing L$50 each, created by Hair Fair Designers, as well as other designers and peoples of SL. You can also find direct donation kiosks littered around the various sims. Last year Hair Fair raised $18, 800.91 USD, lets make this year even more memorable! All Booth links below the cut. Freestyle booth numbering does not correspond to the official Hair Fair Event map. There will be 10th Anniversary Gift Guides for each sim being posted over the course of the day.